Nine of the most vicious spiders in the world. Very few people like spiders. Even the smallest ones can be quite scary. Well, at least they're harmless. Right! Not really! Some of them can not only give you nightmares but also guarantee you a trip to the hospital or even heavier consequences. But what are these highly poisonous spiders and how can you protect yourself. Don't worry we have all the answers. Cheiracanthium Inclusum or simply yellow sac is a spider with a yellow-beige abdomen. Its size ranges from point 11 inches to 0.39 inches and it is considered to be responsible for the majority of bites in the world. Needless to say, it bites are quite painful and its venom is necrotic it basically damages and kills skin tissue, as a result, your skin begins to itch and swell. As for their hunting technique, they're not content with just catching their prey within a web. They actually, hunt for them at nighttime. Thankfully they don't necessarily want to be around people but you might come across them while gardening or when in their preferred habitat. If you want to minimize any chances of meeting a yellow sac be sure to seal all of the holes cracks and gaps in your home's doors, windows, and foundations. Now those yellow sacs definitely won't get you. It's not hard to recognize the redback spider. It has a black body with a bright red stripe on the upper side of its abdomen. If you live in Australia, in Southeast Asia, or New Zealand you have a good chance of running into it. Don't worry, though! Redback spiders aren't naturally aggressive and usually don't attack people on the spot unless they're provoked however they are still responsible for the majority of serious spider bites in Australia. Its female redbacks you should stay away from. Since the males are way too tiny to seriously harm anyone. Females can reach a size of 0.39 inches and their venom is extremely toxic. It affects your system slowly causing severe pain, nausea, and muscle weakness. If you are bitten, use an ice pack for first-aid, and visit the hospital right away. The Chinese Bird spider or Haplopelma schmidti is one of the largest Asian spiders to be found in China. 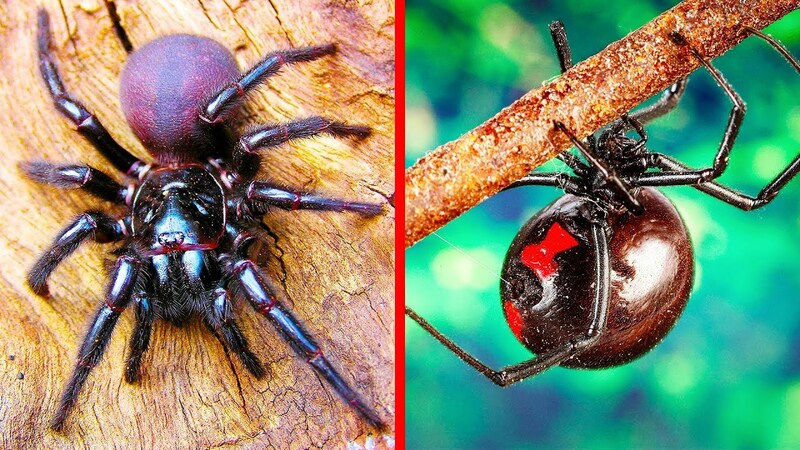 Where it tops the list of the most venomous spiders and Vietnam. It has a dark yellow brown body and reaches around eight inches in size. Chinese bird spiders usually live in burrows and emerge only to find prey. Their venom is called neurotoxin and it makes the spider's victims incapable of moving plus it's so deadly that even minimal doses of it can be enough for small mammals! Chinese bird spiders aren't big fans of people either: if disturbed, they will act aggressively invite you, if this happens to go to the hospital as quickly as you can. If left untreated a Chinese bird spiders bite can lead to all kinds of awful consequences. Loxosceles Reclusa also known as the brown recluse spider, is one of the most poisonous spiders in the entire world. These guys reach up to 0.7 9 inches and love to hide in dark and warm places. Especially behind furniture. Well, we don't know about you but we're definitely checking all the corners of our house right after this article. Anyway, brown recluse spider venom is necrotic and can easily destroy the walls of blood vessels near the bite. A victim may end up developing an ulcer on their skin that can take a couple of months to heal. In the most severe cases, the bite can become infected and as you can probably guess, it won't be pretty. So the best course of action would be to wash the bite with soap as soon as possible, elevate the bitten area, apply a cold compress, and visit the doctor immediately. While we're on the topic of recluse spiders let's meet another one. Loxosceles Laeta or the Chilean recluse spider. These guys usually reach one and a half inches in size and they like to chill out in South America, Chile, Peru, Argentina, and Brazil. In general, Chilean recluse spiders don't show any particular signs of aggression toward people. Nevertheless, they can bite when pressed against human skin. After that, possible symptoms may vary from simple skin irritation to death of skin and other cells. Don't forget that a first aid kit should include an ice pack an aloe vera which will be useful for the bite. These measures will help to at least relieve the pain while on the way to the hospital. How can we forget about the most popular and well-known spider out there? You may know it as the Black Widow but its scientific name is Latrodectus and it forms a whole genus of spiders that can be found all across the world. The black widow's body can vary from 0.12 inches to 0.39 inches in length. And just like pretty much all other spider groups, female black widows rule the spider world. Reaching an impressive 0.51 inches. But their venom is one of a kind too. It contains Latrodectus making the black widows bite incredibly dangerous. But according to reports, the situation is even more dramatic. Apparently, a black widows venom is 15 times stronger than a rattlesnake. However, there are three simple factors that determine how harmful the bite will be: The dose of the venom, the person's physical condition, and their age. Of course, children and seniors are at the top of the danger list. But the statistics are quite optimistic, and most people who are bitten end up not needing medical treatment. Still, they have to deal with muscle pain, abdominal cramps, and muscle spasms that last from three days up to several weeks. Australia is widely known to be a home for tons of dangerous creatures. And the Sydney funnel-web spider( Atrax Robustus) is certainly one of the scariest! The length of its body ranges from 0.4 inches to 0.2 inches and they can be very frequent guests of your pool or garage. Interestingly, general spider world rules don't apply to Sydney funnel-web spiders. Since it's the males who are most active and in charge here! Their bites are extremely painful thanks to the acidic ph of their venom. Plus their fangs have no problem penetrating human skin. The good news is, that as soon as you get to the hospital you'll receive an antidote. But don't let that calm you down. The Sydney funnel-web venom takes a toll on your body very quickly. So the earlier you get to this antidote, the better. #2 Six- Eyed Sand Spider. Let's take a little break from all those extremely dangerous spiders. And just look at the way this spider buries itself. Kind of cute, right! Well, it was actually Hexophthalma. The Six- Eyed Sand Spider getting ready to catch its prey. This spiders body can reach up to 0.6 inches in length and its legs are usually about 2 inches long. Six-Eyed Sand Spider aren't that aggressive either, but if they decide to attack it's better to run away as quickly as possible. Since toxicology studies show that this spider's venom is the most poisonous out of any spider. Six- Eyed Sand Spider prefer to live in deserts so they don't bite people often. However, some cases revealed that their venom generates the accidental death of cells. Resulting in the destruction of blood vessels and tissue. Just like with any other spider bite, the earlier you get to the hospital, the easier recovery will be. The spider with a poetic name of Phoneutria (Brazilian Wandering Spider) is definitely not to be messed around with. Not only is it naturally aggressive, but it's also not one inch or two inches but six inches in size! These guys mainly live in tropical South America. But sometimes they can be found in Central America as well. In general, Brazilian Wandering Spider are lazy throughout the day and prefer to start their quest to find prey at night. And believe us if you come across this spider you surely won't forget it. Their venom contains neurotoxins that generate loss of muscle control and respiratory distress. All of this accompanied by extreme pain and nausea can lead to full-fledged cardiac paralysis. Of course, medical attention is absolutely necessary here. So you should visit the doctor right away. But let's hope we never meet any of these guys face to face. So what do you think, which one of these spiders scares you the most? Tell us in the comments below.